Towards the end of last month, Dallas WFAA sportscaster Dale Hensen took Jerry Jones to task when he delivered an ether-like broadcast about Jerry and how hypocritical he looked talking his about his players respecting the Anthem at all times while keeping his cap on during the Anthem at training camp. It took almost two weeks, but the Dallas Cowboys owner finally got around to speaking about the incident and he decided not to give a comment about it the incident, answering, “No. No. No,” according to David Moore of the Dallas Morning News. 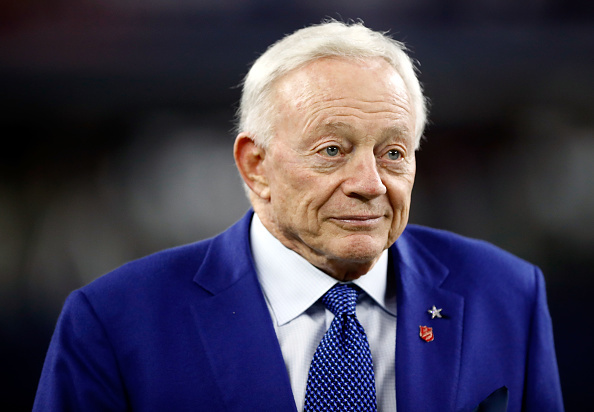 Jones and his son have boldly stated that all current players on the roster will not have the option of staying in the locker room and will require players to stand with “toes on the line” during the playing of the national anthem. The Cowboys are one of few teams who haven’t had a single player participate in the protests during the Anthem.